With all the frequent and often international travel I do, sometimes nothing makes me happier than a long, relaxing weekend in a cool city like San Francisco. Where better to spend a romantic Valentine's Day than in this fun city--less than an hour away by plane--filled with fabulous restaurants, gorgeous settings, fun touristy attractions and of course, great hotels? 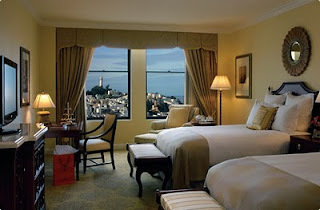 Everytime I visit this city I like to try a different hotel and new neighborhood, but after my recent experience at The Ritz-Carlton, San Francisco, I'm not sure I'll ever switch again. Perched high up on Nob Hill , the Ritz-Carlton bears an interesting resemblance to the White House and service is, as you might expect at such a stately classic, beyond top notch. The newly renovated Club Level rooms (pictured) are definitely the way to go; with fresh displays of homemade treats pretty much morning to night, this is the best Ritz-Carlton Club Lounge I've seen (ranking up there with my favorite at Hotel Arts in Barcelona). I must admit, the all-day dining benefits of the Club Lounge were enjoyed in moderation as this trip was definitely centered around incredible meals! Favorites were enjoyed at restaurants including The Slanted Door (best Vietnamese food in the city, and possibly the States), Postrio (a timeless classic), Fleur de Lys (go for dessert if you can't get a coveted dinner rez) and Michael Mina (relocated in the original Acqua spot, just down the street from another favorite hotel, Mandarin Oriental San Francisco). Also loved lunching with friends at Murray Circle at Cavallo Point Hotel in Sausalito; I highly recommend this on a sunny day! And of coure, set aside time for leisurely dim sum at Hang Ah Tea Room; the decor is no-frills but it's one of Chinatown's best! In between all the eating, our favorite activity was walking...up and down the hills, through North Beach, past Fisherman's Wharf, and of course over to Ghiradelli Square. I can't possibly go to San Francisco without a visit to my favorite chocolate shop. In fact, I'll definitely stop in again when we return to San Francisco in May for another special occasion and a few more amazing meals! If you'd like to experience a luxurious trip to the City by the Bay, contact us for more information about our Virtuoso/STARS rates at the Ritz-Carlton which include breakfast, $100 food & beverage credit, free internet access, and priority upgrades. We also have terrific Preferred Partner benefits (daily breakfast, priority upgrade and a complimentary lunch) at the lovely Four Seasons San Francisco and special perks for our clients booked at the Mandarin-Oriental, the Fairmont, Campton Place among others. Contact us for more details at 310.979.9036 or reach me via email stacy@elitetravelinternational.com. Your acclaim address contains errors, about certainly, and if you do not altercation the information, it does not get corrected. This affects around database backup every aspect of your life. Understand how and why those errors action and what you charge to do about it. Thank you for sharing the post! I wish I could be there someday.